New information offered by LandscapingNetwork.com details walkway lighting tips and ideas for lighting various types of walkways, garden paths and steps. Expert information and tips on walkway lighting techniques for creating inviting and functional walkways. New from LandscapingNetwork.com, the leading source for landscaping ideas online, is expert information and tips on walkway lighting techniques for creating inviting and functional walkways. Walkways come in all forms and can be made from an assortment of materials. Most popularly, flagstone and concrete walkways can be found leading the way at homes and businesses across the country. And no matter where the placement, proper lighting techniques create safe and inviting walking environments for pedestrians everywhere. Landscape lighting is not a subject to be taken lightly. Specifically pathway lighting can mean the difference between a path that is fully functional and safe to walk at night, to one that cannot be used at all. For this reason The Landscaping Network has published a handy article featuring expert tips on walkway lighting. This is a guide for consumers and designers faced with a walkway lighting project. The article covers path and step lighting techniques, and offers two helpful diagrams showing where to properly place lights. The site also covers helpful tips on lighting mistakes to avoid, like placing lights too close together, and more. 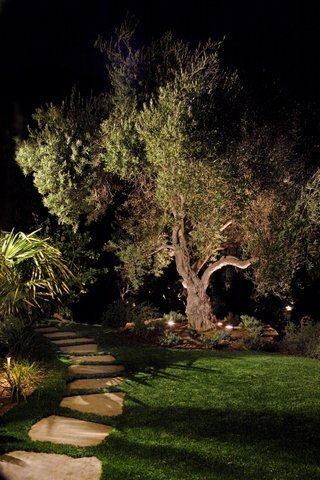 For more information on walkway lighting tips, and to find local lighting landscape contractors, visit LandscapingNetwork.com. 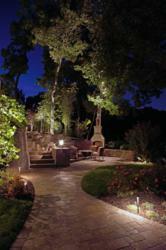 Photos courtesy of McKay Landscape Lighting in Omaha, NE.